Volvo sent out a "Stay in the Loop" email that solely communicated connecting with the company on Facebook and Twitter. It's the first time I've seen any automaker send out an email communication out to their mailing list that only promotes the brand's social presence. Most emails are putting some sort of link to a Facebook page or Twitter account, but that is usually relegated to the end of a quarterly email communication. There's nothing really significant here from Volvo, but it is interesting to see the brand solely promote its social links with zero promotion of a vehicle. What's nice is the call-to-action is straight forward, but do customers or potential customers really want your company sending them emails about liking them on Facebook? It is nive to see the brand solely promote its social links with zero promotion of a vehicle. I know in my experience most email marketing teams are very cautious to send out too many email communications and it seems a bit intrusive to send one solely for social media follows/fans, but that's why I wrote about it. It's definitely an unusual tactic. 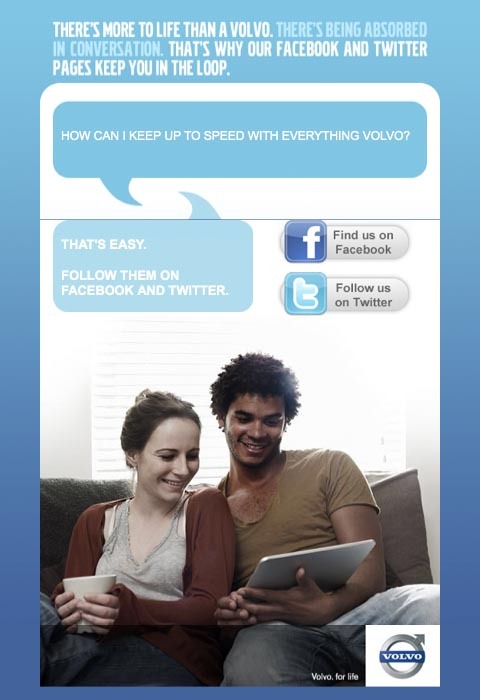 So, Volvo finally tries itself to share in social media. Nice Volvo and that's nice to choose the communication through Facebook and Twitter. I think in this way Volvo be able to get more customer relationships for its different products.